Frasier Crane could be coming back to TV very soon. A new report from Deadline broke the news that Kelsey Grammer was exploring a revival of the iconic series that ran for 11 seasons on NBC. When E! 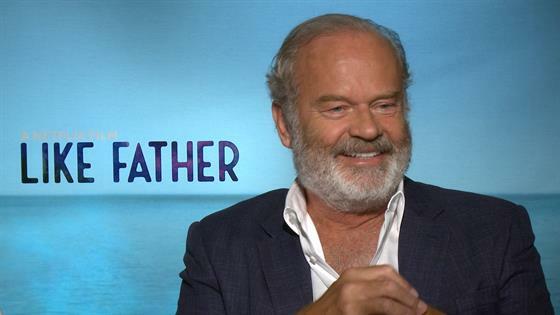 News spoke with Grammer and his costar Kristen Bell about their new movie Like Father we had to get some scoop on what's going on with the future of his Emmy-winning series. "We don't know," Grammer said about whether or not the reboot is actually happening. "It's been discussed. I think the article kind of made it sound a little bit more a sure thing than it really is." Frasier ended with Grammer's Dr. Frasier Crane ending his radio talk therapy show and leaving Seattle for Chicago where he planned to reunite with Charlotte (Laura Linney). According to Deadline, the new series could see Frasier surrounded by a new cast of characters. "There are a couple of ideas," Grammer told us. "They range from pretty much all over the world." All over the world, including…Frozen's fictional kingdom of Arendelle, according to Bell. Say what?! "Well, tell them: He's moved to Arendelle. He's currently dating Princess Anna," she said. "There's some issues in the castle," Grammer said. "That need to be resolved"
"That's right," Bell played along. "Frasier steps in and gives Anna and Elsa some therapy." Frasier, a spinoff of Cheers, ran for 11 seasons on NBC. The comedy also starred Jane Leeves, David Hyde Pierce, Peri Gilpin and John Mahoney. Grammer and Bell star Like Father premiering Friday, Aug. 3 on Netflix.